WILLI is a social toy designed to help children, especially the ones affected by Autism Spectrum Disorders, by learning simple abilities, also in playing and staying with the others. Willi is a toy designed for all, that it can be used by anyone, as they prefer and where they want. This simple toy is based on game, relationship and education, three key words that can perfectly describe the aims of the product itself. Willi is born from the study of a difference, but has been designed with the concepts of equality and integration. 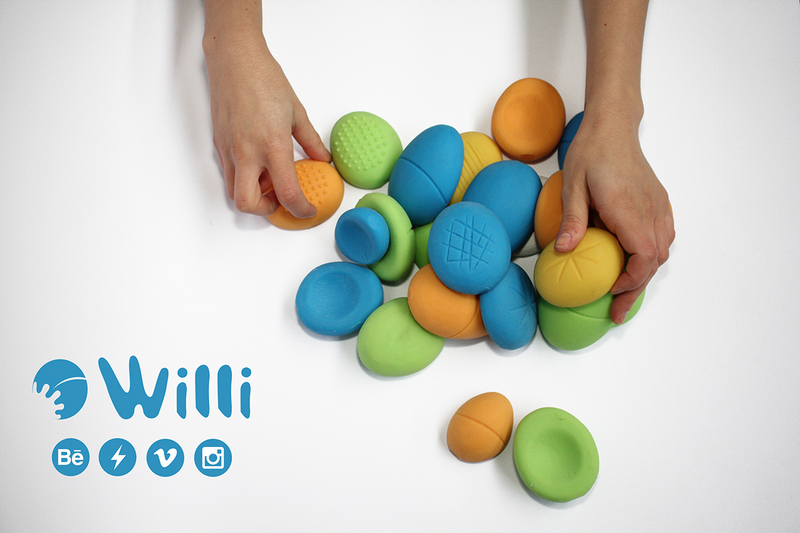 Willi is a modular toy designed with a very simple form, soft, natural and friendly. It is made of silicone, a non-toxic, hypoallergenic and safe material that makes this toy perfectly safe and suitable for children, autistic or not. It has three variants (basic (1), lines (2) and texture (3), each one with different characteristic, but with some details in common: as you can see in the photos, each pebble has a flat base, designed to improve the stability of the toy. To make the game easier and avoid the unexpected, there is a little “excavation” on each base, designed to improve the stability when we put one pebble on another.The size of the product are designed to ensure a safe and non-ingestible toy. Texture and each details have been designed to make sure of a stimulating, fun and educational playing experience. Willi is a social toy made of silicone, in the shape of a pebble and as such it can be used: the colored pebbles can be used by children to create forms and shapes, by placing them on the floor or by creating constructions with them. Another purpose for them is that they can be used for teaching children simple concepts like how to count, recognize colors and texture, learn spatial concepts, improve memory, imitation and imagination and much more. Willi has three variants, each one with different characteristic that make this toy suitable for any kind of game and perfect for children. This toy is meant to be used alone, with other children or with family, but also as a support for learning moments. It has also a set of illustrated cards designed to help children in the early stages of learning. Willi is meant to be used alone, with other children or with family, but also as a support for learning moments. In each packaging you can find more than a simple toy: 11 coloured pebbles, 20 illustrated cards designed to simplify the educational experience and 1 felt bag to bring Willi with you everywhere you go. This bag can be used even during educational moments expecially to teach spatial concepts.